Hello again all you lovelies. Well I found a little time again last night for a play so I decided to use this bad boy again on a quick tag. That cat is sure in an awkward position. PaperArtsy Stamp set... Emma Godfrey EEG15. Clarity Stamp stencil... Double Sprig 7" x 7". Stazon Ink pad... Jet Black and Bibrant Vioet. Archival Ink pad... Fern Green and Sunflower. Ranger Distress Oxide ink pad... Twisted Citron, Peeled Paint, Lucky, Clover and Fossilized Amber. Layer the distress oxide inks onto a craft sheet and spritz with water. Lay the card down onto the ink and keep doing this until happy with the coverage. Blast dry with a heat tool and repeat the process using the colours as desired. Once happy give the card a good spriz with water. Dry again. Flick on some larger drops and leave to dry naturally to allow some good oxidization. Once dry, place the stencil over the card and sponge through with the peeled paint. Blast with a heat tool until dry. Stamp the dog and cat onto some spare card with Momento Ink. Colour with your chosen medium and colours. I chose alcohol pens. Cut out carefully and go around the edge with a black marker. 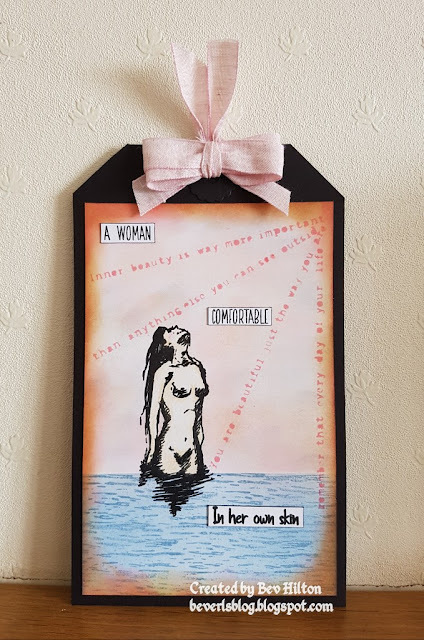 Having placed my images onto my card surface I decided I needed something more on my background so took three elements from the PaperArtsy stamp set. The first one is the swirly circles and stamped at random using the Fern Green. I then took the element which are the lines around the edge and stamped with Vibrant Violet. 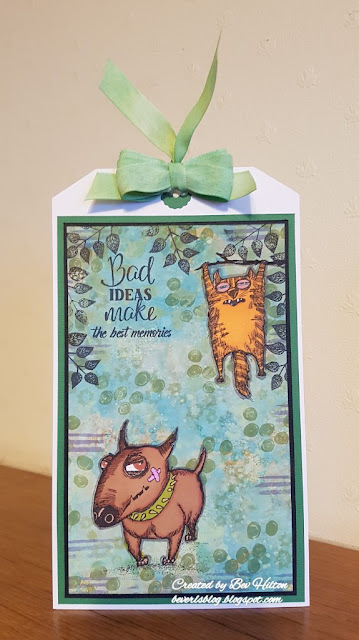 The third element look like spiky circles which were also stamped randomly using the Sunflower ink.The verse is from the same stamp set as the cat which was stamped using the Jet Black. Glue the images into place. To ground the dog I used the dots pen. I decided at this point some leaves would be good so chose the leaves from the Cardio stamp set, which were stamped with Jet Black. Mount the finished piece onto black card and then onto some matching coloured card. Mount onto a piece of white card allowing an inch at the top to form a tag. Cut off the corners and punch a hole for the ribbon. Cut two hole reinforcements in the matching card colour and glue in place. I did't have any matching ribbon in my vast ribbon stash. Does it matter? No of course not as we can make our own matching ribbon. I always have lots of white ribbon for this purpose. Cut a piece sufficient for the bow. lay some distress oxides down on the craft sheet as before and spritz with water and dab the ribbon through until covered. Spritz ribbon until wet enough for the ink to soak into the ribbon thoroughly. Dry with a heat tool and there you have it. Perfect matching ribbon. Thread one piece of ribbon through the hole and then make a bow with the rest of the ribbon. I made a triple bow and glued this in place with a hot glue gun. Hope you like it. Thanks for dropping by. Take care and happy crafting. Oh Bev, you know I love this , it is gorgeous, filled with good humor and so sweet too. The background is beautiful and your tone mix looks amazing, these two surely had "fun" together, and it hasen`t ended yet ,LOL. A wonderful creation, dear friend.